Recently, Doc and I made a trip to the Cancer Center for our monthly visit. We are one of many teams of therapy dogs that visit patient’s while they are receiving chemotherapy and other treatments. Although I have my daily job of working with Doc’s patient’s, Doc says it’s important that we volunteer our time and I agree. The cancer patient’s have a special place in Doc’s heart as both of her parents had cancer. Doc has often told me that every person has a story to tell if you will only listen. Some of the patient’s we are meeting for the first time, so Doc relies on me to open the door and put them at ease. It makes me feel good when I see one of the patient’s eyes light up when they see me. 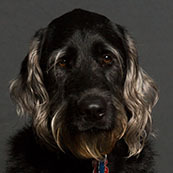 They ask questions about me and how I became a therapy dog. This usually leads to a discussion about dogs they currently own or ones they have loved and lost. People love talking about their pets and it takes the focus off their cancer for just a little while. One day a man showed us a picture of his cute dog and then became tearful as he was telling the story. He told us he had to have the dog put to sleep that week because the dog was very sick and no longer had any quality of life. I thought about how the man could probably relate to his dog’s suffering, so I went over and rested my head in his lap for a long time. It has to be scary not knowing how the story is going to end and being faced with your own mortality. I have heard Doc tell her patient’s that it’s important not to let your disease define who you are. Whether it’s cancer, aids, heart disease, or addiction. You can easily lose yourself in the treatments, tests, medication and the changes in your health and life if you let it. Lauren Hill, the 19-year-old college basket ball player that died recently after a 15 month battle with brain cancer was a shining example of how to continue living your life with cancer. In the time after her diagnosis, she co-founded The Cure Starts Now for cancer research and raised 1.5 million dollars. She also had a goal and achieved it by playing on the college basketball team for Mt. Saint Joseph. Her motto that was worn on the team jersey was “Never give up.” Her family and friends said she stayed positive and appreciated her life until the end. 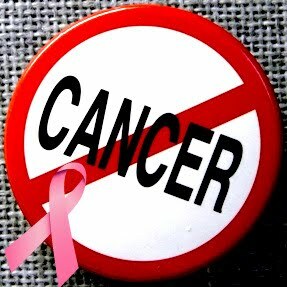 Cancer is a terrible disease that affects many people and the families that love them. Some people end up in remission and go on to live a cancer-free life, while others succumb to the disease. So, until cancer is cured, you will find me on my rounds at the center. The patient’s are always thanking me for coming to visit, but I leave feeling like I am the one that got the biggest reward. At times, you humans can come up with some very interesting ideas about life. Why, just the other day I was minding my own business while basking in the warm spring sun and happened to overhear some gossip about a couple that were using a parenting style called “free-range” parenting. 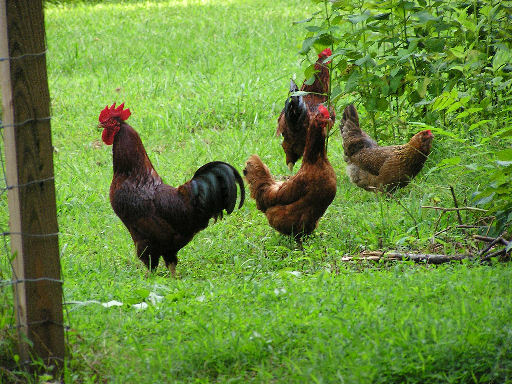 I couldn’t imagine what they were talking about, as the only free range behavior I have seen, is with the chickens next door to the veterinarian’s office that run around the yard looking for grubs. As the discussion heated up, I moved in closer so I could hear every word in case I needed to fill Doc in later. The neighbor’s debate started over a news story that two suburban parents came under scrutiny when they dropped off their 10 and six year old at a park one mile from their home to play and told them to be home by 6pm. As the children were walking home, the police stopped the children for being unsupervised and took them to Child Protective Services. (The law in their town states that all children under 18 need to be supervised.) This was the second time in four months the police picked the children up. The parents feel that allowing their children to play and walk alone in the neighborhood helps them to learn self-reliance and responsibility. As the discussion progressed, I learned about another parenting style called “helicopter parents.” The neighbor said a helicopter parent is a parent that pays extremely close attention to a child’s everyday life, especially at school and sometimes in sports. In other words, they are helicopter parents because they are always hovering overhead. These parents feel it’s their right to make parenting decisions for their children because they know their own children best and don’t think anyone outside of the family should interfere. Good grief! I had heard enough and it was time for me to go inside and think all this over. When I was a puppy, my mom let my brothers and sisters gradually explore the world. If one of us went to far, she would grab us by the scruff of the neck and bring us back to her side. It was a balance of learning and guidance. When I went to live with Doc at 10 weeks old, she acted like one of those helicopter parents, hovering over every move, sneeze or whine. She was a really nervous dog mother. But a funny thing happened, as Doc got more confident raising me, she let me test my independence. Now I have learned to do things on my own, but also know that Doc is there if I need her. 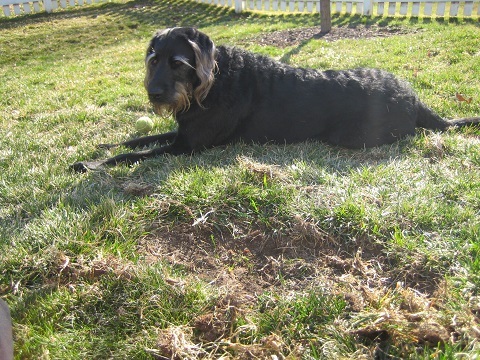 After the hard winter we had in the Midwest, Doc and I were happy to get back out in the yard and start working on some landscaping projects. I started one last fall when I was still a puppy and worked on it all through the winter when ever the ground would thaw out. By spring I had cleared a large space of sod and dirt. The snow covered up my hard work, so Doc was unable to see or fully appreciate the beauty of what I was creating, until one warm spring day when all the snow finally melted away. I was so proud to show Doc what I had accomplished and stood over the hole with my tail wagging, waiting for her praise. Much to my shock, when Doc saw what I had been doing all winter, she got mad. She stood next to me with her hands on her hips and then her face turned so red, that I thought for a minute her head was going to blow off. She glared at me, turned on her heels and headed for the garage. When she returned she had a rake, some grass seed, straw, a hammer, some green fencing and posts. I stood there in amazement as Doc made short order of filling up my hole and then she put a big green fence around it. When she was done, she was sweating and muddy. She glared at me, pointed her finger and told me to stay away. She didn’t need to tell me twice. As she went back into the house I decided to lay low until things calmed down and spent most of the morning on the back porch sulking and nursing my wounded pride. Later that afternoon, Doc came back outside in a better mood holding a bunch of tools and some potted flowers. I became very confused when she knelt down and started digging her own holes in the ground. Thinking it was now ok to dig, I went over to help her and she got mad again! “What is it with you humans?” Doc just glared at me and said “Grover, what is wrong with you?” Clearly Doc and I had a communication problem. A few days passed when one day Doc came home from the hardware store with some railroad ties and two big bags of sand and dirt. To my amazement I watched as she went over to the corner of the yard, put the railroad ties in a square and filled the middle with the dirt and sand mixture. Then she buried my favorite bone and some of my toys in the dirt. She looked at me smiling and said “You can dig here, not in the yard or the flower beds, understand?” In response I wagged my tail with glee. I have to hand it to Doc, just when you think you’re doomed to a life of boredom, she comes up with a wonderful compromise that we can both live with. Now that I am a older, I have been trying to understand and embrace the holidays that human’s celebrate. 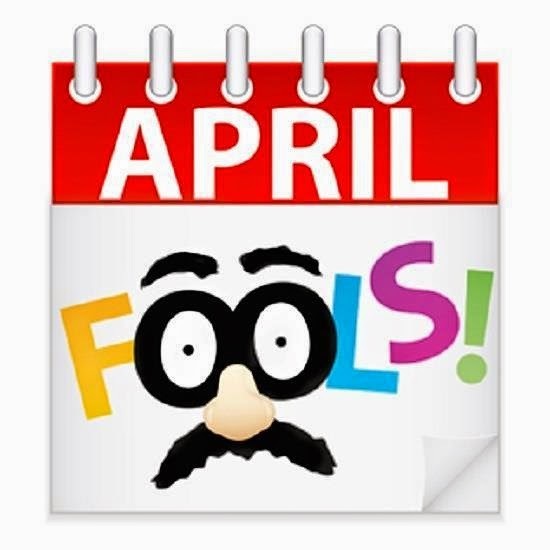 When I heard about the tradition of April Fool’s Day, I was all in. I immediately wanted to play a trick on Doc. Now, I have to admit that the whole thing didn’t exactly go the way I planned it. Call it a momentary lack of judgment on my part, but at age two I still have puppy brain. Well that’s my excuse anyway. Since I am new at this, the first thing I did was go on the internet to read up on the top April Fools pranks. One of the pranks entailed scraping the cream out of the middle of Oreo cookies and replacing it with toothpaste. Good, but not what I was looking for. I liked the idea about filling the middle of glazed donuts with mayonaise, but why waste good donuts? Another suggestion was making a copy of a scary monster face and placing it accross the toilet seat rim so when Doc would open the lid, the monster would be looking up at her. But, I decided it probably wasn’t a good idea to scare Doc with her pants down. Putting a hole in the bottom of her cup so liquid would leak out on her just seemed kind of juvenile. After much consideration, I came upon a plan that would be just the right trick. While Doc was taking a nap one day, I got her gym bag out of the closet. I filled the bag with the most embarassing things I could find. XXXL underware with big pink flowers on it, hemorrhoid cream, an autographed picture of Barry Manilow and a fake ID for the Zombie Survival Club. I made sure there was identification with her name on it that could be seen as soon as the bag was opened. Later that night when Doc went out to run some errands, I had one of Doc’s co-workers come over and get the bag so she could bring it to work for me the next morning. As soon as we got to the office on April 1st, I retrieved the bag from my co-conspiriter and carried it in my teeth down the dimly lit hall trying not to be discovered. When I got to the break room, I partially hid the bag behind a chair and left, waiting for it to be discovered. I could’t wait for someone to look through it to find out who it belonged to, bring it to Doc and embarass her. Then I would hold up a sign that said APRIL FOOLS!! I did learn a couple of lessons from this experience. I will think things through before I play any more pranks and I will be more careful about who I trust to be my partner in crime. Some humans blab under pressure.